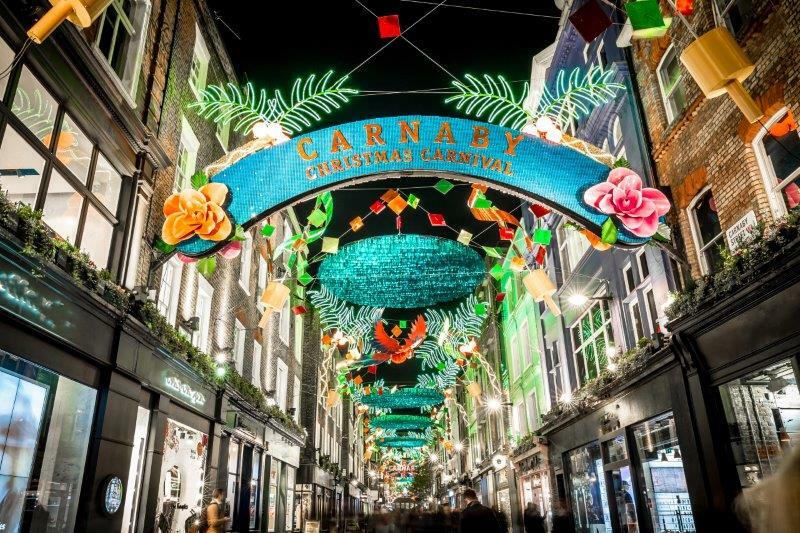 Look up to the skies and see a Queen-inspired installation as part of this year’s Carnaby Christmas lights. Find Freddie Mercury’s iconic Bohemian Rhapsody lyrics written in bright neon over Carnaby’s 14 glowing streets, which are filled with independent boutiques – perfect for a spot of Christmas shopping. There is no dispute, Carnaby has an iconic heritage. From being the birthplace of Swinging London in the 1960’s, the home of Mods, Skinheads, Punks and New Romantics to the street style tribes of today. Carnaby has and always will be the epicentre of culture and lifestyle in London’s West End. Learn more about Carnaby’s history. Both stations are approximately 3 minutes by foot. The nearest national Rail train stations to Carnaby are Euston, King’s Cross St Pancras and Charing Cross. Euston Overground: Follow signs to Euston Underground Station. Take the Victoria line, southbound, one stop, to Oxford Circus. King’s Cross St Pancras: Follow signs to King’s Cross St Pancras Underground Station. Take the Victoria line, southbound, to Oxford Circus. Charing Cross: Walk to Trafalgar Square, from Bay T, take bus route 159, 13, 453, 6, 88 or 12 and alight on Regent Street. Carnaby is a pedestrianised area, so it is only possible to park in surrounding streets. If you are using GPS or Sat-Nav, please use the follow address: Carnaby St, City of Westminster, London, UK, W1F 9PS. As Carnaby is a pedestrianised area, it is possible to walk around with ease. Use the map above to find your way around. Bicycle parking is located at the north of Carnaby Street next to Liberty Department Store. New Cross Inn Hostel is approximately 25 minutes away by car. Check availability and pricing.